Are you among the ones who approach pumpkins only to carve out Halloween faces? Are you among those who leave these otherwise miracle foods for vegetable shows, fairs and contests? Are you also among the geniuses who think it is not advisable to introduce pumpkins to the table all thanks to the fancy weight loss foods available in the market today? If you have answered yes to any two of the three mentioned questions, this may be time to look a little differently at this vegetable which is blessed with multiple benefits. From improving and maintaining the health of the eyes to playing a key role in improving and lowering blood pressure conditions; from a healthier heart to improving sleep, there is much more that can be added to the list. Pumpkins are a very good source of a number of essential vitamins like B1, B2, B6, C, E and beta carotene along with housing essential minerals like iron calcium, magnesium, potassium, phosphorous and even proteins! Pumpkin Juice – This is first and perhaps the simplest way to introduce a treasure trove of nutrition to your everyday diet. For making pumpkin juice, all you have to do is choose a sweet pumpkin de seed it, chop it into chunks and juice it in your juicer. While the flavor of sweet pumpkin is good enough to sweep you off your feet, you can also add certain cinnamon powder or spices as such to enhance flavor. 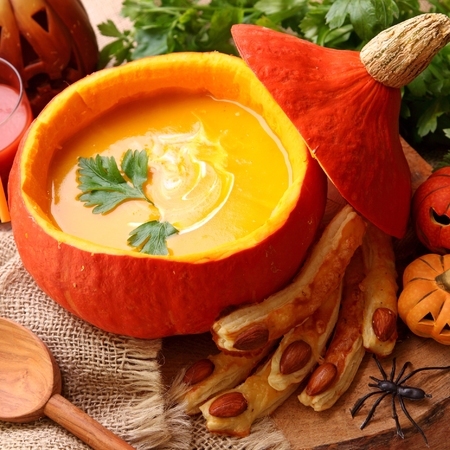 Pumpkin Soup – There are about a hundred different recipes for making pumpkin soups each of which offers a burst of flavors while delivering a boost of energy. Pumpkin contains a whole lot of fibers which tends to make it heavy, which in turn makes it more filling than other options of vegetables. So, while you can be assured of keeping the calories in control with a bowl of pumpkin soup, you can also be confident about the fact that hunger pangs won’t overtake you. Pumpkin Seed Snack – Pumpkins are blessed with a thousand seeds (or more). When you de seed pumpkins, accumulate the seeds wash and dry them. When dry, sprinkle some oil and spices of your choice and bake it till golden. Stock in air tight containers and enjoy a handful as and when you want. Pumpkin Smoothie – This is easy. Take a sweet pumpkin, chop in chunks and throw it into a mixer. Pour in a cupful of yogurt, certain spices for flavor and honey for sweetness and blend. Chill or drink raw. Go Ahead and Eat Raw – On locating a pumpkin that is sweet enough, you can dice it, add roasted spices, sugar and salt and brave it raw. However, try not to eat too much at a time. Half a bowlful is enough to satisfy your senses.